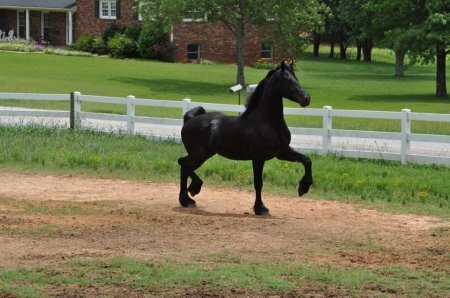 Ringo is one of our new FHANA registered friesian stallions on the property. He has surpassed all expectation when it comes to training and all around manners. He has a great head on his shoulders and is very kind and friendly in the barn. He also is a very quick learner, picking up on new training ques within minutes. Ringo's foals are bred to have lots of hair, long elegant bodies, sweet temperaments and a natural suspension perfect for many riding disciplines.